A diverging diamond can be constructed for limited cost, at an existing straight-line bridge, by building crisscross intersections outside the bridge ramps to switch traffic lanes before entering the bridge. The switchover lanes, each with 2 side ramps, introduce a new risk of drivers turning onto an empty, wrong, do-not-enter, exit-lane and driving the wrong way down a freeway exit ramp to confront high-speed, oncoming traffic. Studies have analyzed various roadsigns to reduce similar driver errors. Bottom right:Traffic crosses back over to the right side of the road. The Missouri Department of Transportation was the first US agency to construct one, in Springfield at the junction between I-44 and Missouri Route 13 (at 37°15′01″N 93°18′39″W﻿ / ﻿37.2503°N 93.3107°W﻿ / 37.2503; -93.3107﻿ (Springfield, Missouri diverging diamond interchange)). Construction began the week of January 12, 2009, and the interchange opened on June 21, 2009. This interchange was a conversion of an existing standard diamond interchange, and used the existing bridge. The interchange in Seclin (at 50°32′41″N 3°3′21″E﻿ / ﻿50.54472°N 3.05583°E﻿ / 50.54472; 3.05583) between the A1 and Route d'Avelin was somewhat more specialized than in the diagram at right: eastbound traffic on Route d'Avelin intending to enter the A1 northbound must keep left and cross the northernmost bridge before turning left to proceed north onto A1; eastbound traffic continuing east on Route d'Avelin must select a single center lane, merge with A1 traffic that is exiting to proceed east, and cross a center bridge. All westbound traffic that is continuing west or turning south onto A1 uses the southernmost bridge. Australia – Caloundra Road interchange on the Bruce Highway (Exit 188) in the Sunshine Coast Region of Queensland as part of a wider upgrade. Construction began in May 2017 and is expected to be complete late 2020. Belgium – The junction of N4 and N25 in Mont-Saint-Guibert near E411, currently a roundabout, will be converted to a diverging diamond interchange. Glendale Avenue interchange on the Queen Elizabeth Way in Niagara-on-the-Lake, Ontario is planned to be reconstructed as a diverging diamond interchange. The MTO is planning to reconfigure the interchange at Highway 400 and Mapleview Drive in Barrie, Ontario. Lithuania – The existing interchange between A1 and A6 near Kaunas is planned to be reconstructed as a diverging diamond interchange. The existing at-grade intersection between the Mopac Expressway (State Highway Loop 1) and Slaughter Lane in Austin, Texas is being converted to a diverging diamond interchange; construction is ongoing and the DDI opened on November 11th, 2018. Final construction will complete in January 2019. The existing interchange between FM 60 (Raymond Stotzer Parkway) and FM 2818 (Harvey Mitchell Parkway) at Texas A&M University in College Station, Texas is being converted to a DDI; construction began on March 6, 2017 and is expected to last 25 months, with an estimated cost of $14.1 million. The Interstate 5/State Route 510 interchange in Lacey, Washington will be reconstructed into a DDI, the first in the state; construction is planned to start in late 2018 and to be complete in 2020. The existing interchange between Interstate 75 and Union Centre Boulevard in West Chester Township, Butler County, Ohio, near Cincinnati, is planned to be converted to a DDI; the project is scheduled to begin in 2019 and be completed a year-and-a-half later at a projected cost of $13 million. The existing interchange of Interstate 89 and the concurrent stretch of U.S. Route 7 and U.S. Route 2 in Colchester, Vermont, near the Winooski city line, will be developed into a DDI in the spring of 2021. The existing interchange at Loop 1604 and FM 2696 (Blanco Road) in San Antonio, Texas will be converted to a DDI. Construction is currently projected to start in 2021. The existing interchange between I-75 and State Route 725 in Miamisburg, Ohio, near Dayton, is planned to be converted to a DDI; the project will not be built until 2023 and its projected cost is $4.1 million, entirely funded by the state. The existing interchange between I-70 and North Kipling Street (SH 391) in Wheat Ridge, Colorado, near Denver, is planned to be converted to a DDI. As of February 2019, neither the timeline nor the cost have been established. The existing interchange at US 281 and Jones-Maltsberger Road in San Antonio, Texas will be converted to a DDI. This project has not yet been funded, so no timeline has been set. Two-phase signals with short cycle lengths, significantly reducing delay. Reduced horizontal curvature reduces the risk of off-road crashes. Increases the capacity of turning movements to and from the ramps. Potentially reduces the number of lanes on the crossroad, minimizing space consumption. Reduces the number of conflict points, thus theoretically improving safety. Increases the capacity of an existing overpass or underpass, by removing the need for turn lanes. Costs significantly less than a normal interchange. Drivers may not be familiar with configuration, particularly with regard to merging maneuvers along the opposite side of the roadway or the crossover flow of traffic. Pedestrian (and other sidewalk-user) access requires at least four crosswalks (two to cross the two signalized lane crossover intersections, while two more cross the local road at each end of the interchange). This could be mitigated by signalizing all movements, without impacting the two-phase nature of the interchange’s signals. Free-flowing traffic in both directions on the non-freeway road is impossible, as the signals cannot be green at both intersections for both directions simultaneously. Highway bus stops are appropriately sited outside the interchange. The design depends on site-specific conditions. Additional signage, lighting, and pavement markings are needed beyond the levels for a standard diamond interchange. Local road should be a low-speed facility, preferably under 45 mph (72 km/h) posted speed on the crossroad approach. However, this may be mitigated by utilizing a higher design speed for the crossing movements. ^ Hughes, Warren; Jagannathan, Ram (October 2009). "Double Crossover Diamond Interchange". Federal Highway Administration. FHWA-HRT-09-054. Retrieved April 22, 2012. ^ a b c "Missouri's Experience with a Diverging Diamond Interchange" (PDF). Missouri Department of Transportation. May 2010. p. 4. ^ "Diverging Diamond Interchange". OHM Advisors. ^ "Gallery: Looking Back at the 100 Best Innovations of 2009". Popular Science. Retrieved January 20, 2012. ^ Staff (June 13, 2013). "I-64 Interchange at Route 15, Zion Crossroads". Virginia Department of Transportation. Retrieved December 11, 2013. ^ Chlewicki, Gilbert (2003). "New Interchange and Intersection Designs: The Synchronized Split-Phasing Intersection and the Diverging Diamond Interchange" (PDF). Archived from the original (PDF) on October 20, 2011. Retrieved October 20, 2009. ^ Patch, David (May 2, 2005). "French Connection May Control Traffic Flow". The Blade. Toledo, Ohio. Retrieved April 8, 2014. ^ Sedensky, Matt (March 30, 2006). "Missouri Drivers May Go to the Left". Star-News. Wilmington, North Carolina. Associated Press. Retrieved April 8, 2014. ^ "Wrong Way? Not in Kansas City". Land Line Magazine. March 31, 2006. Retrieved April 8, 2014. ^ Staff (April 2009). "I-44/Route 13 Interchange Reconstruction: Diverging Diamond Design". Missouri Department of Transportation. Archived from the original on June 7, 2011. Retrieved May 19, 2009. ^ Springfield District Office (June 19, 2008). "Public Meeting Tuesday, June 24, On I-44/Route 13 Reconstruction To Reduce Congestion, Improve Safety" (Press release). Missouri Department of Transportation. Retrieved June 19, 2008. ^ Yourex-West, Heather (August 14, 2017). "Canada's first 'diverging diamond interchange' now open to Calgary traffic - Calgary | Globalnews.ca". globalnews.ca. Retrieved March 7, 2019. ^ Edara, Praveen K.; Bared, Joe G. & Jagannathan, Ramanujan. "Diverging Diamond Interchange and Double Crossover Intersection: Vehicle and Pedestrian Performance" (PDF). ^ "Alternative Intersections and Interchanges". Retrieved November 25, 2018. ^ "Bruce Highway Upgrade – Caloundra Road to Sunshine Motorway". Queensland Department of Transport and Main Roads. May 18, 2017. Retrieved May 18, 2017. ^ "Un nouvel échangeur pour supprimer les bouchons au carrefour de la N4 et de la N25". RTBF Info (in French). June 6, 2018. Retrieved June 17, 2018. ^ "Žemės paėmimo visuomenės poreikiams projektas" (PDF). ^ "MoPac South: Diverging Diamond Interchange Simulation". Central Texas Regional Mobility Authority. April 16, 2015. Retrieved September 30, 2018. ^ "About MoPac Intersections". Retrieved February 18, 2018. ^ "MoPac Intersections". www.txdot.gov. Texas Department of Transportation. Retrieved September 27, 2018. Note: This source incorrectly refers to interchanges as intersections. ^ "FM 60 (Raymond Stotzer Parkway) Overpass Improvement". ^ Washington State Department of Transportation. "I-5 - SR 510 Interchange - Reconstruct Interchange". Washington State Department of Transportation. Retrieved April 29, 2018. ^ Callahan, Denise G. (March 30, 2017). "Relief on the way for Union Centre Boulevard traffic congestion". Journal-News. Liberty Township, Butler County, Ohio. Retrieved October 6, 2018. ^ Callahan, Denise G.; Blizzard, Nick (October 4, 2018). "Union Centre traffic to get help from new Ohio interchange design". Journal-News. Liberty Township, Butler County, Ohio. Retrieved October 6, 2018. ^ "Exit 16 DDI: Diverging Diamond Interchange". Vermont Agency of Transportation. 2019. Retrieved April 9, 2019. ^ "Public Hearing - Loop 1604 at FM 2696". www.txdot.gov. Retrieved April 10, 2019. ^ Blizzard, Nick (October 4, 2018). "New Ohio interchange design to aid traffic, safety near Dayton Mall". Dayton Daily News. Retrieved October 6, 2018. ^ Aguilar, John (February 21, 2019). "Time-saving "diverging diamond" may be coming to busy I-70 interchange in Wheat Ridge". Denver Post. Retrieved February 21, 2019. ^ "Open House - US 281 at Basse Road and Jones Maltsberger Road Interchanges". www.txdot.gov. Retrieved April 10, 2019. ^ "Missouri's Experience with a Diverging Diamond Interchange" (PDF). www.modot.org. May 2010. p. 5. ^ a b c "Missouri's Experience with a Diverging Diamond Interchange" (PDF). www.modot.org. May 2010. p. 6. ^ "The 'Diverging Diamond' Interchange Is an Abomination - Sarah Goodyear". The Atlantic Cities. September 20, 2011. Retrieved April 22, 2014. ^ "United States Patent 8,950,970: Double Crossover Merging Interchange". United States Patent and Trademark Office. February 10, 2015. Retrieved October 4, 2016. ^ "TRAFFIC ENGINEERING COUNCIL BEST PAPER and BEST PRODUCT AWARD: Past Recipients". Institute of Transportation Engineers. 2016. Archived from the original on October 4, 2016. Retrieved 4 October 2016. ^ "Alternative Intersections & Interchanges Symposium" (PDF). Transportation Research Board. July 21, 2014. Archived from the original (PDF) on March 5, 2016. Retrieved 4 October 2016. ^ Buteliauskas, Stanislovas; Juozapavičius, Aušrius (June 15, 2014). "Interchange of a New Generation Pinavia" (PDF). Military Academy of Lithuania. Archived from the original (PDF) on October 4, 2016. Retrieved 4 October 2016. Turner-Fairbank Highway Research Center. "Drivers' Evaluation of the Diverging Diamond Interchange". Federal Highway Administration. FHWA-HRT-07-048. Innovations Library (May 2010). "Missouri's Experience with a Diverging Diamond Interchange: Lessons Learned" (PDF). Missouri Department of Transportation. Chlewicki, Gilbert (2003). "New Interchange and Intersection Designs: The Synchronized Split-Phasing Intersection and the Diverging Diamond Interchange" (PDF). Archived from the original (PDF) on October 20, 2011. Retrieved October 20, 2009. Chlewicki, Gilbert (December 4, 2011). "About Chlewicki". The Diverging Diamond Interchange Website. Retrieved January 20, 2012. 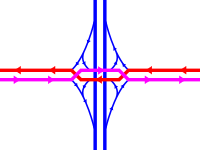 Wikimedia Commons has media related to Diverging diamond interchanges. Images of Diverging Diamond Interchange in Springfield, Missouri the first in North America.